So the other week I got all up with Smitten Kitchen on The Royal Moose, after making some truly delicious rhubarb and cream cheese hand pies. The thing about baking is that you’re never satisfied with the recipes you already have. Always looking for new ideas means that I have got an enormous amount of enjoyment from scouring the Smitten Kitchen website over the past week finding recipes I have never come across before. It was all I could do to not drop everything, go and buy a ton of ingredients, take a week off work and just BAKE. There were strawberry-ricotta graham tartlets and fudge popsicles and pumpkin swirl brownies and the HAND PIES, OH MY GOD THE HAND PIES. Then I had to stop looking at all the recipes. I thought this video was a reasonable distraction. Shout out to Allen Pope for being responsible for this. But I had to restrain myself, and instead have decided that a slower approach would be better – lest all the food go to waste you see (who am I kidding, like I wouldn’t have eaten it all). So two things have been made. Ratatouille Tart. And. Peach Shortbread. (I think I might break the record for number of links to the same website in one blog post). Ratatouille tart made excellent dinner, very simple and quick and also delicious. Highly recommended. 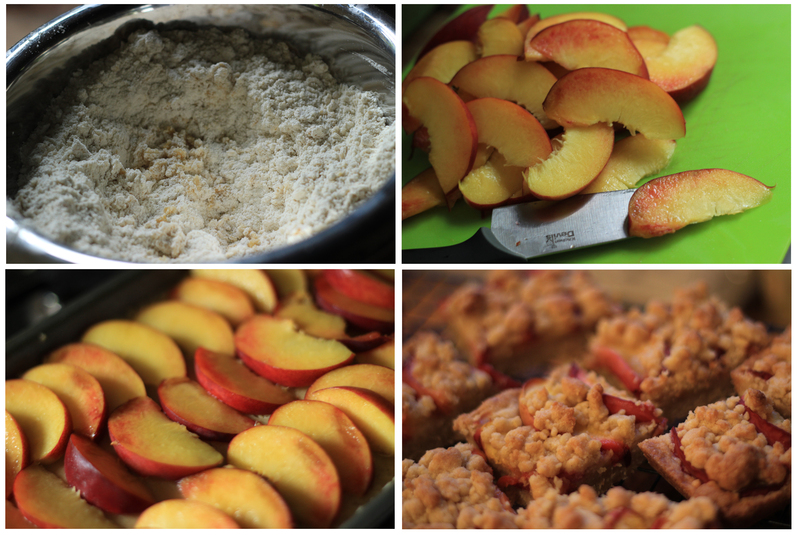 As for the peach shortbread. WELL. It looks beautiful and tastes fantastic, and the recipe is here. I started out intending to do the whole browned butter thing, then realised (after not reading the instructions properly) that I was going to have to freeze my butter. I have the smallest freezer in the world. Not possible, plus waiting half an hour for butter to solidify again – even whilst watching Andy Murray win against Fernando Verdasco – wasn’t something I wanted to do. By this point I’d already started melting my butter though. So I added it melted. Yeah. It did work though – I panicked a little, but it was absolutely fine. So there you go. Peach shortbread and I am happy.